Consider Fig. 3. The celestial sphere rotates about the celestial axis, , which is the imagined extension of the earth's axis of rotation. This axis intersects the celestial sphere at the north celestial pole, , and the south celestial pole, . It follows that the two celestial poles are unaffected by diurnal motion, and remain fixed in the sky. 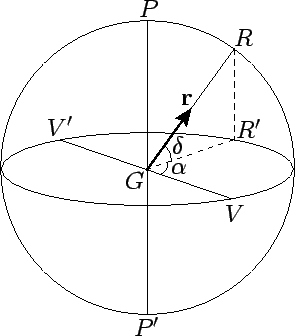 Figure 3: The celestial sphere. , , , , and represent the earth, north celestial pole, south celestial pole, vernal equinox, and autumnal equinox, respectively. is the celestial equator, and the celestial axis. The celestial equator, , is the intersection of the earth's equatorial plane with the celestial sphere, and is therefore perpendicular to the celestial axis. The so-called vernal equinox, , is a particular point on the celestial equator that is used as the origin of celestial longitude. Furthermore, the autumnal equinox, , is a point which lies directly opposite the vernal equinox on the celestial equator. Let the line lie in the plane of the celestial equator such that it is perpendicular to , as shown in the figure. 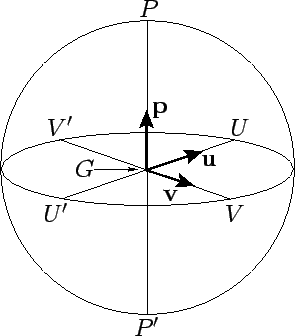 It is helpful to define three, right-handed, mutually perpendicular, unit vectors: , , and . Here, is directed from the earth to the vernal equinox, from the earth to point , and from the earth to the north celestial pole--see Fig. 3. Figure 4: Celestial coordinates. is a celestial object, and its projection onto the plane of the celestial equator, .